From yesterday’s Centre Daily Times, Rep. Mike Hanna, the House Democratic Whip, expresses his strong support for funding PASSHE and rejecting Gov Corbett’s budget proposal. He strikes just the right tone, reminding the Governor (or whoever on the Governor’s staff does his reading for him) that PASSHE tuition hasn’t, in fact, skyrocketted or “gotten out of control,” a mistake (?) the Governor made during his budget address. [The Governor seems unable to understand the difference between state-owned and state-related universities.] Rep. Hanna also strikes the tone in his strong reminder that middle and working-class families in PA are the ones who suffer most from this proposal–exactly the people who seem to have voted for Governor Corbett because he convinced them he was on their side. These efforts now further complicate our ability to deal with the extreme budget cuts proposed by the governor. He uses the terms extreme, catastrophic, etc, all of which are correct. My concern, however, is that by so empatically labeling the cuts as extreme, Rep. Hanna is setting the stage for the Legislature to rationalize smaller but still horrific cuts and claim credit for compromising while doing so. We need to do everything we can not to let that happen. So I recommend writing a letter (not on university e-mail or letterhead!) thanking Representative Hanna for his support, and reminding him that even a fraction of the cuts Corbett has proposed are still nearly impossible for the universities to bear. Come join members of the campus community (students, faculty, staff, administrators, friends) in Sykes Ballroom C at 12:30 on Friday, April 1. Legislators (members of the PA House and Senate) will be visiting campus to receive the hundreds of postcards students and others have filled out, explaining the impacts that Governor Corbett’s proposed budget cuts will have on us. They will also talk to us about the situation from their points of view and help us refine our strategies as we move forward. It’s important that we draw a strong crowd to show our legislators that we really are committed to protecting our university at all levels and for the well-being of all campus community members. The event should be finished by 1 pm. I’d say “We hope to see you there,” but the need is bigger than that. It’s really important we turn out in numbers. Be there if you can. In order to deal with the state’s $4 billion deficit, the residents of Pennsylvania want Corbett to raise taxes on the natural gas industry. Plus, they don’t want him to cut funding for education. And because Corbett is a man of the people, he plans to do the exact opposite. Corbett released his budget last week and it’s a doozy. He’s proposing massive cuts to education. He wants to cut state aid to public schools by a jaw-dropping $1 billion. He wants to freeze teacher salaries. And he wants to cut $625 million from higher education. That amounts to a 50 percent cut for the 14 state-owned universities and the four state-related schools (Penn State, Temple, Pitt and Lincoln University). If this budget passes can you imagine all the services public schools will have to cut? And if that wasn’t bad enough, Governor Corbett has given a coal company CEO unilateral authority to overturn laws and pass out drilling permits as he sees fit. Here’s something I bet you didn’t know. Because of natural gas drilling, there are certain parts of the state where the water is hazardous because it’s flammable. There are videos on Youtube where people set fire to the water as it comes out of their faucets. Drinking that water is dangerous. Number one, it might kill you. Number two, when you go to the bathroom to pee, there’s a good chance you might burn your house down! You know what, Governor Corbett? This is an excellent idea. Let’s make this a national movement. Let’s appoint people to positions they have no business being within 100 feet of. For example, let’s make high school dropout Bristol Palin the head of the Department of Education! Or how about Amy Winehouse as head of the Department of Health and Human Services? Or what if we made Charlie Sheen the Drug Czar? Yes, governor, let’s do that. Let’s give some coal executive power to pollute the state’s water supply as he sees fit. And since you want Pennsylvania to be Texas, let’s cut billions of dollars in education so that the public schools disintegrate into barren wastelands. You know, just like in Texas! And, not only does PASSHE make the article, but the writer actually understands the difference between the state-owned and state-related universities–which seems to be more than we can say for the Governor. The blogger, by the way, is a Visiting Faculty member in Political Science at an unidentified but large landgrant university in the Southeast (and not the U of Florida). This new breed of Teabagger governors is really something special. We are fortunate to live in an era in which the political class is so committed to radical change. It’s exciting. Fresh. Exhilarating. 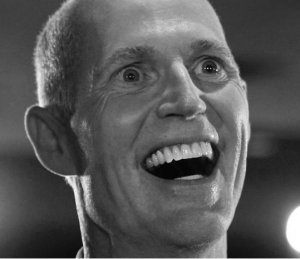 Behold one of the greatest visionaries, Florida’s Governor Rick Scott. The ex-hospital executive and lipless chemotherapy patient faces an uphill battle against recalcitrant, entrenched public sector unions who stand in the way of Progress. I think he’s up for the challenge. Don’t you? 1. A pending bill proposes a performance-based pay system for police officers throughout the Sunshine State. If the crime rate fails to improve based on rolling three-year averages, officers can be fired. They’ll all be working on year-to-year contracts without seniority benefits. Bonuses will be paid to officers who make the most arrests. Legislators believe that the new merit-based rules will encourage officers to follow the law scrupulously and suppress the crime rate for which police are responsible. 2. A proposed Senate bill will create an incentive-based salary structure for trash collectors. Since landfill space is an unwelcome expense (and rapidly diminishing resource) for municipal governments, the new rules will reward garbage men for completing their routes while using the least possible landfill volume. State Republicans believe that the law will encourage waste disposal workers to innovate and develop new means of reducing the volume of trash generated by Floridians. 3. Two radical new laws are experimenting with ways of altering the compensation structure of state firefighters. One plan, soon to be implemented in a pilot program in Bradenton, will pay firefighters for each fire they extinguish. Logically, rewarding firefighters for each fire they put out will ensure diligent work with no conceivable negative impact on the number of fires that occur. A separate program (currently testing in Opa-Locka) takes a different approach, terminating the contracts of firefighters who allow buildings to burn down or for fatalities to occur in fires. This makes sense, as firefighters are ultimately the people who control outcomes in this area. 4. House Bill 415 creates a pay-for-performance system for the Governor, State Supreme Court, and legislature. Governors will receive no salary if the state unemployment rate increases on their watch, which is fair inasmuch as Governors are tasked with determining unemployment rates. The court will pay judges by the case and terminate lower-level judges whose cases are overturned on appeal more often than average. Legislators will be paid on a similar per-bill system, with penalties for failing to meet a 500 bill per session quota. 5. Florida Gators football coach Will Muschamp, the highest paid state employee in Florida at $2,500,000 annually, will have his contract restructured to a complicated formula based on wins, time of possession, and successfully executed fake punts. Broadly speaking, Muschamp will earn roughly $100,000 per Gators victory, potentially saving the cash-strapped state over $1,000,000 annually. 6. In the event of a failed citrus crop, Florida Agriculture commissioner Adam Putnam will receive no salary for that calendar year. A successful citrus crop is the responsibility of Commissioner Putnam and his office. 7. The Florida Department of Children and Families will face budgetary cuts for each fiscal year in which the percentage of abused children in the state rises above the national average at the state level. The Cato Institute described this incentive-based scheme as the best way to guarantee a safe childhood and home environment to as many young Floridians as possible, as the FDCF will have the strongest incentives to get out there and combat child abuse. Gov. Scott has barely scratched the surface. If the potential of pay-for-performance government is Mount Everest, the recent restructuring of teacher compensation and tenure is just a few pebbles in your driveway! By understanding all of the relevant mechanisms of causality and assigning responsibility to the appropriate actors, government can not only operate more efficiently and save money but also provide the very best services to its constituents – without exception or compromise. If any of you haven’t yet been following the story out of Wisconsin of Professor William Cronon, you should. An article in this morning’s (Mon 3/28) Inside Higher Ed provides a solid account. Cronon’s case is important because i[t] indicates the length to which this new breed of Republican will go to ensure compliance and squash dissent. One more reason these folks are going after tenure. After all, the original purpose of tenure was to ensure that the government or an institution could not silence unpopular arguments. It was a protection against the kind of tyranny we are seeing in Wisconsin. Tom Corbett hasn’t directly named public unions or university faculty as enemies of the state in the way that the Walkerites in Wisconsin have, but his attack on our budget couldn’t be more clear evidence that he’s perfectly willing to destroy us. Anyway, more germane to the Cronon case, what we’re seeing around the country right now is an all-out effort to squelch shared governance and academic participation in our national and state politics. The attempts at suppression don’t just cross campus boundaries but sit squarely on both sides of the boundaries. 1. While the WCU policy on email/internet usage doesn’t specifically preclude using your WCU email for political purposes, it seems like a good idea not to–especially given that President Weisenstein made a point of saying so (and saying not to use WCU letterhead for correspondence with government officials) on his Budget Update page. 2. Start an account with a commercial service; APSCUF will need you to have one anyway if you don’t already. Otherwise, as we move into preparations for our contract expiration, you’ll be uninformed. We simply won’t send out organizational messages or updates on negotiations to campus email addresses; this shouldn’t be news to anybody on either side :). I recommend Gmail, for a bunch of reasons I can explain if you care. In the end, I think the law is on Professor Cronon’s side, as it would be on ours should somebody come (metaphorically, I hope) knocking at my door to complain about this blog or my personal one. But why tempt fate? Or, as I wrote in an email exchange about Cronon with a colleague the other day, who the hell has time to fool with that kind of challenge when we’ve got actual work to do? WHEREAS, Pennsylvania’s students contribute thousands of dollars a year to the state and local economies, and approximately 70 percent of graduates of Pennsylvania’s colleges and universities remain in the state. They provide the workforce that sustains the state economy. WHEREAS, On March 8, 2011, Gov. Tom Corbett introduced his first state budget proposal, which would cut state funding to Pennsylvania’s community colleges, public colleges and universities, and state-related universities by more than 50%. When combined with the reduction in federal funding, community colleges will see a 10% decrease in funding, the State System of Higher Education’s budget will be reduced by 54%, and state-related universities’ budgets will be decreased 51%. Additionally, the governor’s budget proposal included a 1.9% cut to Pennsylvania Higher Education Assistance Agency grants. WHEREAS, large tuition increases and increasing loan debts will make it even more difficult for these students to continue to afford college and could discourage interested students from applying in the future. Larger class sizes and program cuts will make it difficult for students to obtain a quality education in a timely manner. Therefore, we resolve to support the students of Pennsylvania and call on members of the Pennsylvania Senate and House of Representatives to reject these cuts to higher education. We urge them to continue to fund at prior levels community colleges, state colleges and universities, and the state-related universities in order to continue to provide a quality education for all of Pennsylvania’s students. Thanks, NEA, for the support and for the smart articulation of the issues.